This Curvy Large Three Drawer Chest delivers sophistication and plenty of storage space for your items. Ideal for bedrooms, dining room areas or even in your living room, the chest is completely handmade using high quality mahogany wood. It features a wide body with a curvy shape instead of the regular rectangular design. A smooth top surface offers a solid area where you can display various items. Meanwhile, down the centre, you get full width drawers for storage. Each drawer is decorated with two beautiful ornate brass handles on either side. The dark finish of the brass as well as the intricate design contrasts against the satin pearl finish of the chest, making them stand out even more. 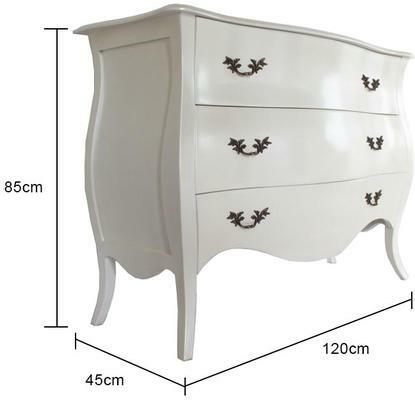 Finally, the chest is finished off with a curvy bottom and slim legs.